The Deputy Speaker, Plateau State House of Assembly, Rt Hon. Saleh Shehu Yipmong has disclosed that the People’s Democratic Party, PDP will not make any meaningful Impact in the forthcoming general elections in the state. 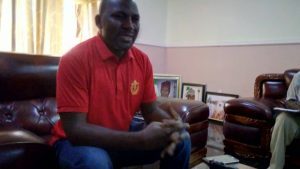 Yipmong, a member representing Dangi Constituency in the State House of Assembly, made this disclosure in an exclusive interview with Nasarawa News Blog at his residence in Federal Low Cost in Jos North local government on Sunday. He says APC is one of the rooted political parties in Plateau state and beyond what people are merely speculating as according to him, the Party is fully embraced by the majority of the citizens in the state due to it’s policies and programmes it has embarked upon by the leadership from the executive and the legislative arms in plateau. “I want to assure you that there is no strong opposition in Plateau state, because PDP that is supposed to be a formidable force to fight the APC to a stand still, is not serious. They are not doing the needful. “If they are saying that President Muhammadu Buhari is too old to rule and they went and brought another old man of similar age to contest for the governorship of the state, how do they want people to take them serious? “APC in the past four years has remedied all forms of challenges which they inherited from the sixteen years of PDP governance. We have introduced an all inclusive government. “Before 2015, Plateau state was witnessing attacks everywhere, People were living in a segmented areas, Muslims were afraid of going to Christian areas, and Christians were afraid of going to Muslim areas because there was a lot of apprehension. “Today, we have made programmes that have changed the lives of the people, we have made peace in the state and have broken the jinx of ‘No Go Area’ as both divides move freely. “So let me tell you that, APC has no challenger in Plateau state, you said the president is old and you are bringing an old man to the state, it doesn’t make sense”. He added. The lawmaker who is re-contesting for the position of a state legislator said that he is confident of sweeping the polls, saying he had made a remarkable impact on his constituents and as such his people have assured him of giving him another mandate to consolidate on the gains so far made. According to him, apart from legislating on issues that would make life bearable to the public, a free medical outreach was held where over two thousand people benefited. “I also sank five boreholes in my constituency, and when we came in, the whole of Kanam, it was only Dangi that had electricity, and I had to extend from Dangi Town by providing a transformer to extend power supply to Kunkyam. “I also upgraded primary health care in Kagir as well as build a town hall and constituency office to ease the burden of the people from running up and down, looking for how to reach me”. There has been no response to "2019 Election: "PDP Lacks Capacity To win Plateau Poll’ – Saleh Shehu Yipmong"